Poor oral health can affect anyone’s everyday life, which is why it is of the utmost importance. We always recommend that our patients schedule a regular check-up and cleaning every 4-6 months depending on oral health needs. Be sure to call our office and book your next dental cleaning. Don’t wait for a problem to get worse before coming in! Routine cleaning is key to a cleaner mouth. Most dental cavities escalate quickly, so visiting our dental office in Fresno, CA every 4-6 months will allow our Fresno Dentists to address it. Please contact Milburn Dental Office in Fresno, CA at (559) 825-0990 or simply drop into our dental office. We accept new patients and walk-ins. Routine Dental Cleaning with Milburn Dental’s Dentists in Fresno, CA. 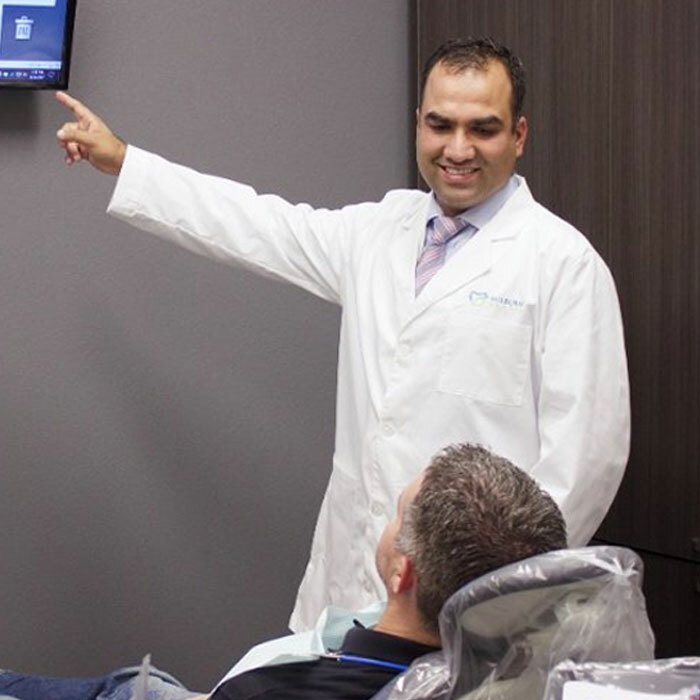 What happens during a typical dental checkup at Milburn Dental in Fresno, CA? Well, let us tell you all about it! According to the American Dental Association, about 80% of Americans visit their dentist at least once each year for a regular dental checkup. However many people have little to no idea what is actually happening in their mouth while they’re in the dental chair. Hearing strange noises and having someone work inside your mouth can understandably cause a lot of stress and anxiety. But not to worry, we’re here to tell you exactly what will be going on from start to finish the next time you visit our Dentist in Fresno for a routine checkup. After all, the more you know about something, the less scary it seems! Our Fresno CDAs are trained dental professionals who take care of routine dental care, such as regular cleanings and assist our Fresno Dentists in other procedures. They are an integral part of our dental practice here at Milburn Dental and make up a big part of the team that works to keep your oral health at its best. 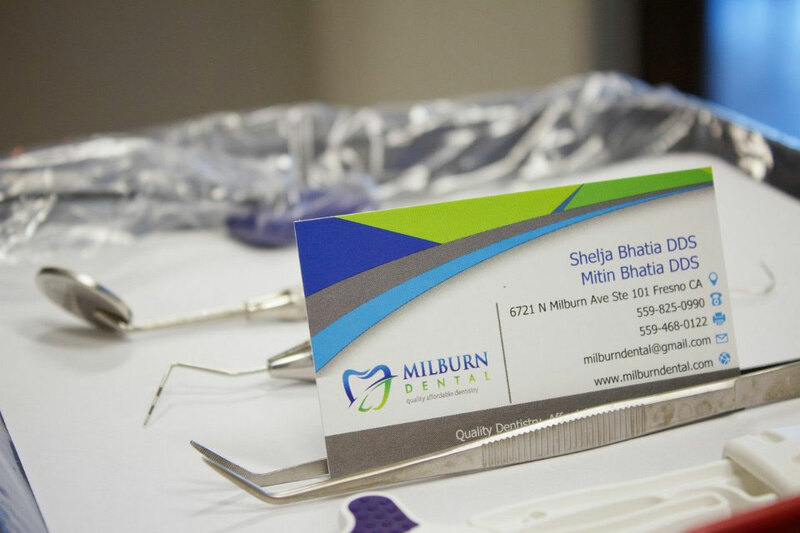 You can think of CDAs as the truly unsung heroes at Milburn Dental in Fresno, CA! Before anything is done inside your mouth, our Friendly Fresno Dentist will need to know about your medical history if this is your first appointment at Milburn Dental in Fresno or, if you have been to our dental practice before, any changes in your health such as new medications, diabetes, arthritis, pregnancy, etc. It is important that our Fresno Dental Care Team knows about any health concerns, anxieties, or allergies you may have in order to avoid incidents and to make sure you get the kind of care you need. Our Fresno Dental Clean Team will also give your teeth a smooth and shiny finish using a tooth polisher with a spinning head and slightly abrasive paste. The polishing will get rid of any residue that was previously missed and will make your teeth smoother so that plaque will not collect as easily on them between visits to the dentist. Our Milburn Dental CDAs will also be on the lookout for the swelling of gums in any areas, mouth sores, and redness. Finally, our CDAs will measure your mouth’s periodontal pockets, which are the spaces between the top of the gum line and where the gum tissues firmly attaches to the tooth. Ideally, this pocket should only be between one and three millimeters deep, however deeper pockets can be a sign of gum disease and thus should be closely monitored. The last thing to do is take dental x-ray pictures of your mouth so our Dentist in Fresno, CA can see if there are any issues below the mouth’s surface. This involves biting down on a piece of specially designed plastic while an x-ray imaging machine is placed against your cheek. The resulting image will show the visible parts of your teeth as well as the roots below the gum line and your jaw bones, allowing our dentist to see exactly what is happening in your mouth and assign your oral care as needed. We want to mention here that our Milburn Dental Office only recommends digital x-rays, which emit up to 90% less radiation, allow for easy storage, and take less time than traditional machines – which means shorter, more convenient, and safer visits for you! The dental exam is different from the initial examination that our CDAs completed as this one is done by our dentist. Our Fresno Dentists at Milburn Dental will use your dental x-rays to see if there is any loss of bone, fractures, or any other abnormality below your visible gum line before moving on to look for issues with jaw alignment, teeth grinding, and oral cancer. Generally, our Dentist in Fresno, CA will feel your jaw bones from outside of your mouth while you bite down to ensure that your bite is smooth, aligned, and there is no clicking or popping from your jaw joints. They will also inspect the grooves of your teeth to see if any of them have been cracked or smoothed down due to grinding or jaw clenching. Finally, our dentist will gently feel behind your jaw and your neck to see if there are any signs of oral cancer. 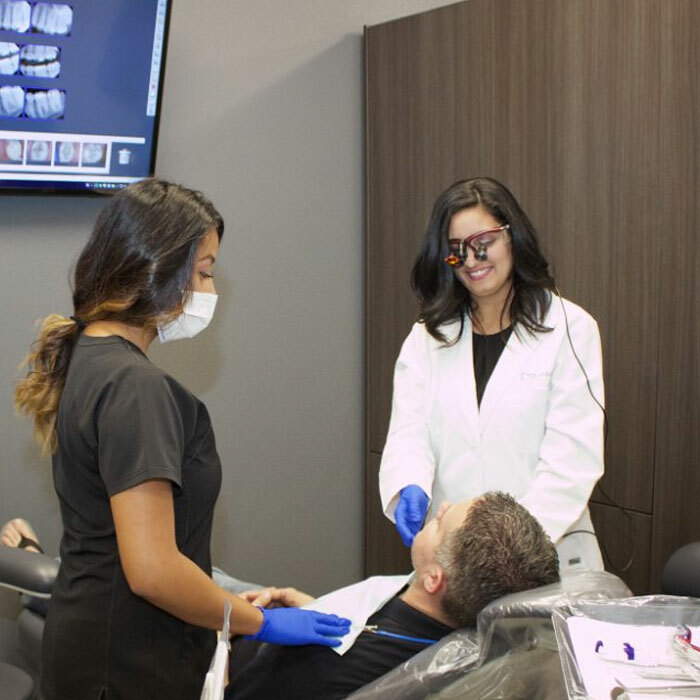 After the dental exam is complete, our Fresno Dentist at Milburn Dental will let you know exactly what is going on in your mouth and will advise you about next steps. Sometimes this involves scheduling another dental appointment at our Fresno Dental Office for a procedure while other times our Fresno Dentist will give you advice about what you can do at home to better your oral health. It is extremely important that you listen to this advice and put it into action as best you can to ensure that your next checkup is the best it can be. To schedule a routine dental cleaning with Milburn Dental Office in Fresno, CA please call (559) 825-0990 or visit our Fresno Dental Office at 6721 N Milburn Ave Ste 101, Fresno CA 93722. We accept walk-ins and dental emergencies! How often should I come visit the dental office? Our dentists recommend a minimum of twice a year, but it depends from case to case. Swing by our office and we’ll have someone look at your teeth. Why is it that some dental cleanings are super painful? Is it the dentists, or is it me? It could be both. Let’s see if I can explain it. There are 2 reasons why your teeth cleanings are painful. 1) Dentist is careless 2)Dentist is doing a thorough job but doesn’t know how to communicate with the patient. At Milburn Dental, our dentists, dental hygienist, CDAs all are encouraged to talk with our patients to see what the pain threshold is. That way, we can get your teeth as clean as possible while keeping you comfortable in the chair.